From Schiffer Publishing. Released 2010. The gunfight at the OK Corral has made Tombstone, Arizona, the most famous Wild West town in America. A century and a quarter after the Earp brothers and “Doc” Holliday faced off against the Clnton and McLaury brothers, their story continues to captivate and polarize. Read about and see reenactment of the famous street fight as well as 100 color photographs of the town – historic Allen Street, Tombstone Court House State Park, Boot Hill Cemetery, early public buildings, churches, and more. Combined with informative text, this book recalls many stories of this iconic town. Purchase Tombstone: Relive the Gunfight at the OK Corral. "What a wonderful book! ... the way (Butcher has) put this book together is pretty much what anyone or any tourist interested in Tombstone would like to known - the story and the photos - and images of today's Tombstone." "Scott Butcher nicely peels away the myths, the legends, and the misconceptions of the cowboys versus lawmen fight (which is the popular conception as to the combatants). He spends the early part of the book introducing the key participants and their roles, and then explores the history of the Tombstone region before presenting the actual gunfight. Butcher's modern photos add tremendously to the understanding of the text and the events depicted therein. The author then takes the reader on a fascinating visual tour of Tombstone, starting with historic Allen Street. The lynch pin of the modern Tombstone recreational area, Allen Street comes alive in Butcher's wonderfully composed photographs and well flowing text. 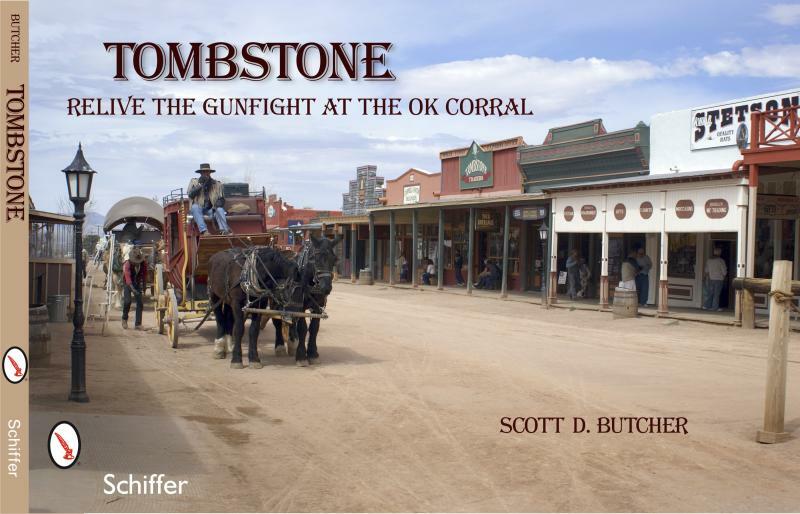 Next, Scott looks around Tombstone and explores its streets and other environs of interest. Finally, he turns his attention to perhaps the most famous element of the Tombstone legend -- Boot Hill.... This is a terrific book, one that will both entertain and educate you. The variety and quantity of photographs is astounding; the text is crisp and interesting; and the layout by the Schiffer graphic designers works well." "Scott has astutely crafted Tombstone’s story in this 96 page book containing 100 color photographs he himself took when visiting Tombstone – a visit that led to the inspiration to bring Tombstone to life in this newest book of his...But what truly inspires one to pick up this book is the beautiful photography that truly captures the Tombstone visitors see today! Imagine if you will, taking a photo of all the famous and not so famous buildings of Tombstone and all the activities surrounding them. With each image captured you take home a memory. Well, this little book is just perfect for that feeling... This truly is a great keepsake book for your Tombstone visit or for getting ready for the long desired visit to our real Old West town and all that awaits you!!"